EXETER– The Monarchs had a chance to pull even in the Central Sequoia League standings last Friday night, but were unable to score the tying point before time ran out in their 2-1 loss to the Kingsburg Vikings. This was the second game against Kingsburg (18-4-1; 11-0) in which Exeter (9-6-2; 8-2-1) ended up on the wrong side of a match by one goal. Kingsburg (18-4-1; 11-0) controlled much of the mid-field and pushed their tempo early on. 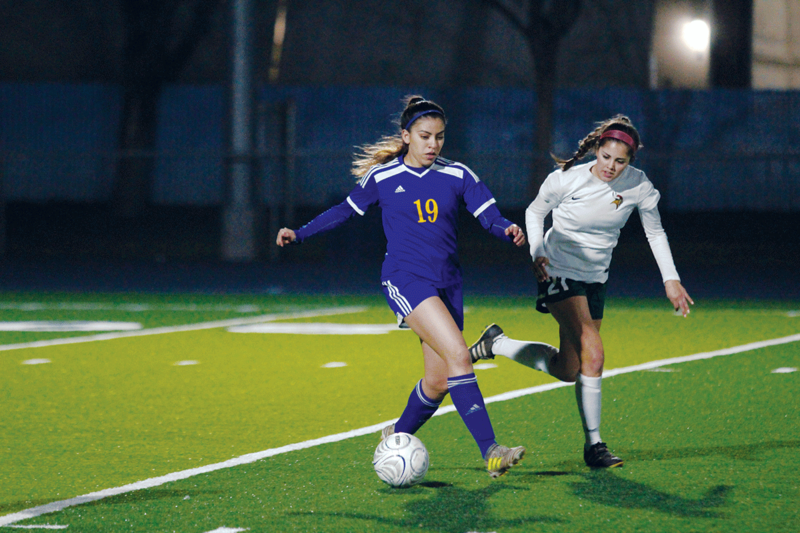 Their long-pass over the top offense produced some opportunities before Marissa Montelongo scored off a corner kick to put Kingsburg ahead 1-0. Exeter tried to counter by possessing the ball and using quick passes up the side of the field. The only problem was it played into the Vikings defensive game plan. Only a few attacks by the Monarchs got past the Vikings mid-fielders and defenders, and the rest were intercepted before they could do much damage. “We just couldn’t keep possession long enough to put together an attack,” Lasky said. Montelongo scored the Vikings’ second goal early in the second half to make it 2-0. As the remaining time continued to dwindle, Exeter threw everyone they had into the offensive zone. The number of players provided some chaos in the Kingsburg penalty box with less than two minutes to go. The ball bounced off a foot and hit a Kingsburg player in the hand rewarding Exeter with a penalty kick. Lexe Cortez scored on the attempt but it was too-little-too-late. This is Exeter’s third one goal loss to Kingsburg stretching back to last year. It is also the third time in four years which Exeter has finished in second place in the CSL. While, this year’s results keep the Monarchs on the doorstep of a league title, Lasky is happy with the way his young team grew. Exeter had many first-year varsity players compete for them over the course of this season including, a few freshmen. “Everything that we’ve achieved this season is a testament to just how hard the girls worked,” Lasky said. Exeter’s last regular season game happened last night on the road against the Dinuba Emperors. Final came after press time. Lasky’s approach has already begun to shift toward the postseason with brackets being released later this week. Exeter is currently projected to get the fourth seed in Division IV. If that plays out, then they will be on the same side of the bracket as Kingsburg leading to potential third match in Kingsburg.